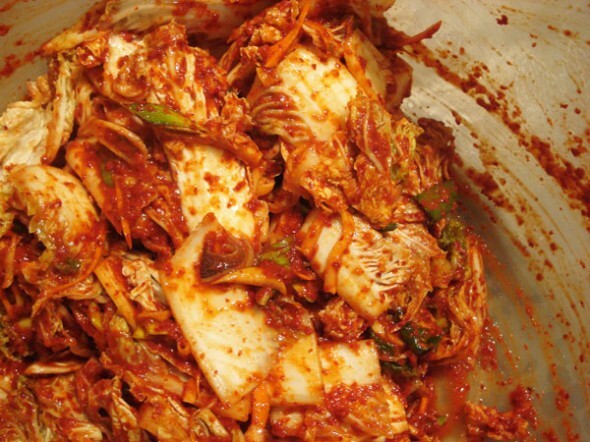 Since I posted my whole cabbage kimchi recipe in June 2007, so many people have surprised me with their kimchi related stories and questions. A lot of my readers make their own kimchi on a regular basis and they email me the photos of their delicious kimchi! Some people modify the recipe to their taste and some people add more ingredients to invent their own kimchi! I’m surprised to see all these mouth-watering looking kimchi photos! I didn’t measure when I filmed the first video recipe years ago. : ) Anyway, whenever I was asked the similar questions, I felt kind of bad and a little bit guilty and I always thought I should post a more accurate kimchi recipe. So this recipe will be for a total beginner. Just follow the recipe step by step. 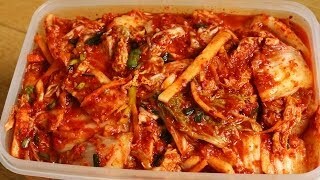 This recipe is mine that I have been using for my kimchi for decades and popular among even my Korean friends. If you want to use whole cabbage kimchi, you can check my whole cabbage kimchi recipe and this easy kimchi recipe, then you will figure out what to do. Only difference is how to handle cabbage: cutting , salting, and how to put or mix the kimchi paste with the cabbage! Did you see how many questions and answers were made for my whole cabbage kimchi? So far 831 comments! These questions are the most frequently asked, so I’m letting you know this. Q: Maangchi, do I have to make porridge to make kimchi? If I don’t want to use porridge, what shall I do? A: No, you don’t have to. Some people don’t use porridge, but I always make porridge to make good kimchi paste. Porridge helps hot pepper flakes, fish sauce, garlic, ginger and all spices mix together. Otherwise, the kimchi paste will be too thick to put it between cabbage leaves easily. So you can use sweet pear juice instead of making porridge if you want. I sometimes use pear to make kimchi paste, too. Q: Maangchi, kimchi never goes bad? How come there is some white stuff on the top of my kimchi? A: If you keep your kimchi properly, it won’t go bad months and months. Don’t forget to press down the top of kimchi in the container with a spoon whenever you take some. It will prevent your kimchi from being exposed to air. If you see the top of your kimchi already has white stuff (mold), remove the top layer of the kimchi and you still can eat the rest of the kimchi. Q: Maangchi, you used squid this time! Last time your kimchi was made with raw oysters! My other Korean friends never use oysters or squid. A: Kimchi recipes vary from region to region, so some ingredients will be different. You can follow a few different recipes and choose the best recipe that suits your taste. Q: I’m interested in adding raw oysters or squid in my Kimchi, but afraid that it might go bad so that I may have a stomachache. A: You should use very fresh oysters or fresh frozen product, then it will ferment along with your kimchi. Q: Ok, Maangchi, can you tell me how to make the salty squid for kimchi? Remove the guts and backbone and rinse it. Add 3 tbs salt and mix it with a spoon. Put it in a container or glass jar and keep it in the refrigerator for a week. Rinse the squid thoroughly until not slippery and drain it (you can skin it if you want). Dry the squid with paper towel or cotton and chop it up. Add it to your kimchi paste! Baechu (napa cabbage 10 pounds), salt, sweet rice flour, sugar, water, garlic, ginger, onion, fish sauce, squid, hot pepper flakes, leek, green onions, carrot, radish. Trim the discolored outer leaves of 10 pounds of napa cabbage. Cut the cabbage lengthwise into quarters and remove the cores. Chop it up into bite size pieces. 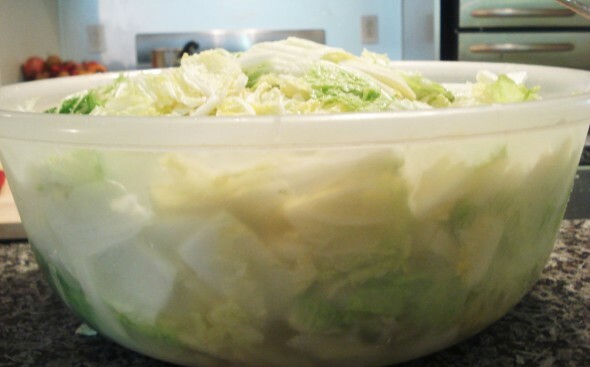 Soak the pieces of cabbage in cold water and put the soaked cabbage into a large basin. Sprinkle salt. Every 30 minutes, turn the cabbage over to salt evenly (total salting time will be 1½ hours). 1½ hours later, rinse the cabbage in cold water 3 times to clean it thoroughly. Put 3 cups of water and ½ cup sweet rice flour (chapssal garu) in a pot and mix it well and bring to a boil. Keep stirring until the porridge makes bubbles (about 5 minutes). Add ¼ cup sugar. Stir and cook for a few more mintues until it’s translucent. Place the cold porridge into a large bowl. Now you will add all your ingredients one by one. Add 1 cup of fish sauce, 2.5 cups of hot pepper flakes (depending on your taste), 1 cup of crushed garlic, 1-2 tbs of minced ginger, 1 cup amount of minced onion. 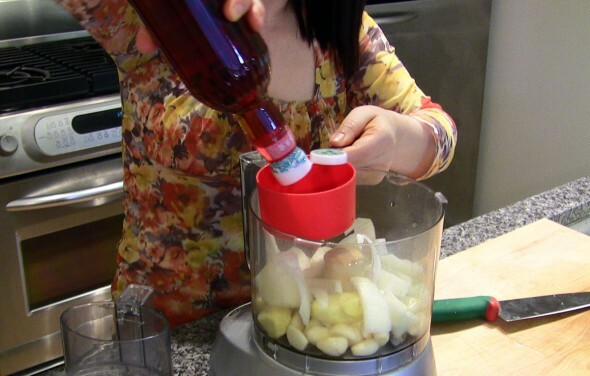 *tip: much easier to use a food processor. Wash and drain the salty squid. 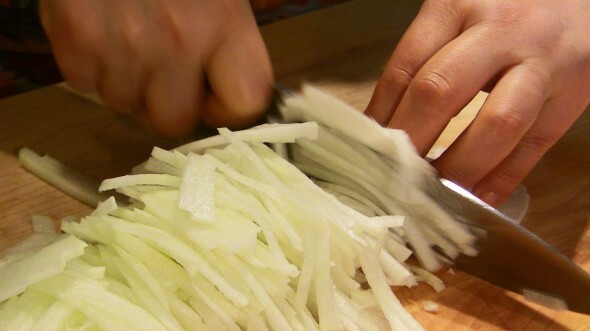 Chop it up and add it to the kimchi paste. *tip: how to prepare salty squid is posted on the FAQ above! Add 10 diagonally-sliced green onions, 2 cups amount of chopped leek, 2 cups of julienned Korean radish, and ¼ cup of julienned carrot. Mix all ingredients well and your kimchi paste is done. Action! Mix the cabbage with the kimchi paste! Put the kimchi paste in a large basin and add all the cabbage. Mix it by hand. *tip: If your basin is not large enough to mix all the ingredients at once, do it bit by bit. Put the kimchi into an air-tight sealed plastic container or glass jar. You can eat it fresh right after making or wait until it’s fermented. I usually put all my kimchi in the fridge except for a little bit in a small container. I like fresh kimchi, so this way the kimchi in the fridge ferments slowly and stays fresh, while the smaller container ferments faster and gets sour. I use this sour kimchi for making things like kimchi jjigae where sour kimchi is better. Then, when the small container is empty, I fill it up again with kimchi from the big container. It takes a little management, but experiment and you’ll get the hang of it! How do you know it’s fermented or not? One or 2 days after, open the lid of the Kimchi container. You may see some bubbles with lots of liquids, or maybe sour smells. That means it’s already being fermented. Posted on Saturday, January 23rd, 2010 at 1:59 pm. Last updated on June 15, 2015. Posted December 27th, 2017 at 3:06 am | Log in to reply. Perfect for 42 degrees heat. From the land down under – Australia. Posted December 2nd, 2017 at 3:42 am | Log in to reply. Posted October 10th, 2017 at 6:26 pm | Log in to reply. Posted October 10th, 2017 at 6:15 pm | Log in to reply. Maangchi I didnt find hot pepper flakes so I found a new method for the people who cant find like me so I thought I would help. Posted October 9th, 2017 at 5:32 pm | Log in to reply. I made the kimchi Saturday afternoon and stored it in some clean glass jars I kept from pasta sauce/salsa. I left them in a tray on a shelf in the laundry room to ferment. Yesterday (Sunday) I released some of the built up air and some of the liquid bubbled out so I just rinsed off the jars and washed out the tray and put it back. But today when I went to release some of the air the tray had a lot of clear liquid at the bottom but none of the jars were broken and it wasn’t red like the kimchi sauce. The kimchi looked a bit separated, too. With liquid at the bottom and the kimchi pushing on the lid of the jar. The sauce seeped out when I was taking the lids off to push it down too. It smells a bit more fishy than most of the kimchi I’ve ever tried. I used Squid brand fish sauce so maybe that’s why? I didn’t add any actual squid or seafood to the kimchi (and I didn’t have any leeks on hand) but other than that I followed the recipe. The temperature of where I put it is about 78 degrees Fahrenheit. Is this normal?? Or did I do something wrong?? Posted October 9th, 2017 at 5:15 am | Log in to reply. Hi! Can I make kimchi without porridge? Because I can’t find sweet rice flour in here, but have normal rice flour. What should I do? Posted July 26th, 2018 at 6:48 pm | Log in to reply. 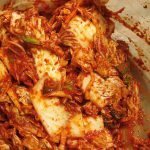 Check out Emergency Kimchi recipe. Posted October 5th, 2017 at 7:33 pm | Log in to reply. Posted October 5th, 2017 at 7:25 pm | Log in to reply. I made kimchi for the first time about two weeks ago using this recipe (with some adjustments since I didn’t have a few ingredients) and it turned out great! I used three containers: two small plastic boxes and one glass jar (thoroughly cleaned, it originally contained store-bought kimchi). I tasted a bit of each kimchi every day and each one tasted a little different from the others, even though they all came from the same batch. I think there might be many reasons why: maybe it’s the container’s material, maybe because the “empty” space was bigger in one of the plastic boxes than in the other containers, the amount of green onion and carrots was different in each container, etc. maybe it’s a bit of everything. But in the end, none of them tasted bad, just different. One of them fermented pretty quickly and tasted great, another started fermenting pretty slowly and still tasted fairly “fresh” after four days outside and it tasted good in its on way! I was a little worried at first, though, because when I was making kimchi, I ate a piece of raw cabbage after salting it and rinsing it 3 times, and it tasted bitter. I thought it was probably normal and that the taste would go away once it was covered with kimchi paste, but when I started tasting the actual kimchi one or two days after making it, it still tasted bitter and kind of strange, but I didn’t know if it was normal since the only kimchi I had ever tasted before was store-bought and it probably wasn’t at such an early stage. I almost thought I was going to have to throw it away but fortunately I found a comment on another site that said that usually, theirs was bitter too for a couple days right after making it but it tasted better after waiting a few days more, so I decided to leave it alone for a day or two, only opening the containers to push down the cabbage back into the brine when I remembered to do so, and after a few days I decided to try again and it finally tasted right! Posted October 19th, 2017 at 10:17 pm | Log in to reply. Sounds like you made delicious kimchi! Congratulations! Posted September 6th, 2017 at 7:00 pm | Log in to reply. Hi, Maangchi. I love your recipes! Two questions: Have you used fresh hot peppers, like the little Thai chiles, to make kimchi? If so, roughly how much do you use? Also, what brand of hot pepper powder do you usually use? It’s hard to find one that’s good and hot enough. Thanks! Posted September 4th, 2017 at 6:05 pm | Log in to reply. okay emergency question. I messed up my cabbage to paste ratio real bad. Don’t ask me how,it just happened.I have soooo much paste left!!! I just want to know if I can shove the paste in the fridge until tomorrow when I can go get some more cabbage. I don’t want it to go to waste!!! Posted September 6th, 2017 at 6:24 am | Log in to reply. Posted September 4th, 2017 at 3:31 pm | Log in to reply. I’m a totally lover of vegetarian kimchi.. so the way I do is, soaking with salt water, 3-6 hours. Then rising then mixing with a sauce I make (ginger green onions, sugar, olive oil, fresh and dry hot pepper, mirin sauce , garlic, plum vinegar, sesame oil ) then I leave it on counter 4-5 days. I had to trow it all in the compost pile……. Every time the SAME problem appreared.. the SMELL OF AMMONIA or some sort of really crazy disgusting chlorine or chimical smell. I just opened my jars this morning of another attempt.. again this crazy bad smell. What the heck am I doing wrong???!!!! Posted September 4th, 2017 at 6:00 pm | Log in to reply. Maybe the cabbage you use now is fertilized too much? Posted September 25th, 2017 at 10:49 pm | Log in to reply. After consulting my Korean friends and trying to rule out the variables that might be causing the chlorine/ammonia smell, I came to the conclusion that kimchi cannot be made during hot weathers in Canada. The chlorine in the tap water + hot weather= chlorinated kimchi. I was able to let the jars of “chlorinated” kimchi ferment in the fridge up until now and they taste great. Posted August 14th, 2017 at 10:45 pm | Log in to reply. Posted July 22nd, 2017 at 10:41 pm | Log in to reply. Posted July 21st, 2017 at 1:55 am | Log in to reply. Posted July 17th, 2017 at 1:09 am | Log in to reply. Posted July 20th, 2017 at 1:58 pm | Log in to reply. Yes, kimchi shouldn’t be watery. You can use more salt when you salt the cabbage and drain the cabbage nicely after rinsing it. 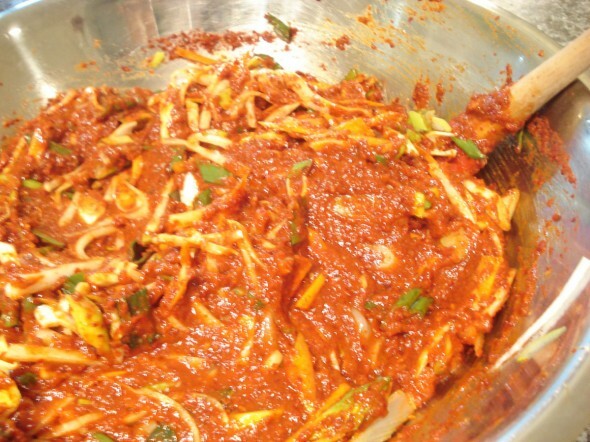 You can squeeze the cabbage slightly with your hands to remove excess water just before mixing it with kimchi paste. This recipe was originally posted on January 23, 2010 at 1:59 pm by Maangchi. It was last updated on June 15, 2015. The video was watched 10,561,232 times on YouTube & has 101,021 likes!